This is the most refreshing juice that I've made in my juicer. Of course it's great in summertime, but it's also quite fantastic to mix with some spirits (for example vodka or gin). Mix and serve over ice! 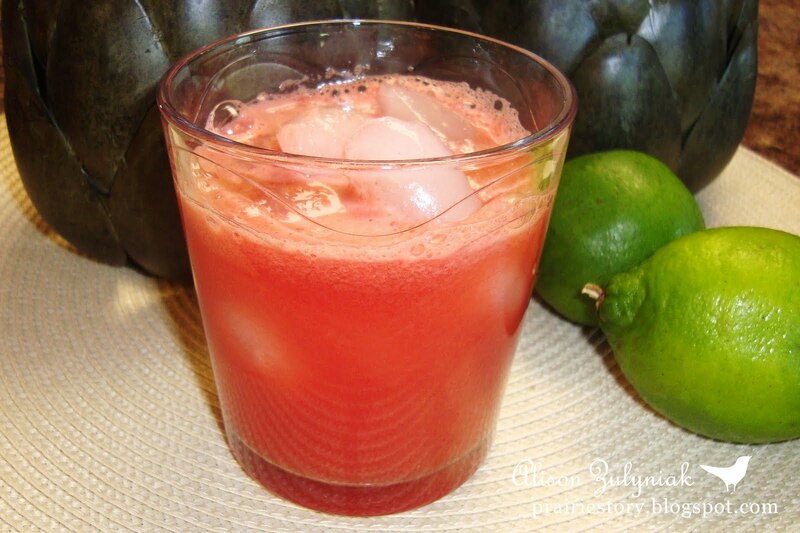 Watermelon is a rich source of potassium, and with their high water content they are an obvious thirst quencher. Limes are an excellent source of free citric acid, natural sugar, vitamin C, calcium and phosphorus. Oooh, I love how cool and refreshing this sounds! This is really refreshing! A glass of this is definitely not enough! My gosh that does sound great, thanks so much. This drink looks delicious and might just make it into my blender. there is actually still watermelon available here. When can I come over for cocktail hour?! YUM! Anything with watermelon and lime speaks to me. This is gorgeous and looks very refreshing. Can't beat that - but it is a bit too cold here for this now. This sounds great. I think I'll be making this in France next summer. Perfect Summer Cooler!